SIMRAD’s slogan is “Technology for sustainable fisheries” and we live by this slogan every day. SIMRAD believes that a sustainable fishery worldwide is the only right way to survive. By sustainable we mean a healthy take out of the world fish stocks as well as an efficient and pro table fishery for the fisherman. SIMRAD believes that technology is an important factor to achieve this. Products that we believe have contributed to a sustainable fishery are Echo sounders with a Split Beam technology: this makes it possible to catch the right size fish. Catch monitoring instruments: this will reduce the impact of a trawl on the fauna, catch the right fish at the right time for better quality, catch the right species and disregard by-catch before it is taken to the surface. These and many more reasons will help obtaining a sustainable and pro table fisheries in many years to come. Efficiency and profitability mean sustainable fishery. SIMRAD believes that an efficient fishing vessel will save the environment in many ways. One is saving fuel and therefore the CO2 emission is reduced since the vessel spends less time on the sea. Efficiency is key to become pro table, however other factors are also important. Catching the right size of fish for example, will give the fisherman a better price and ensure that he is not catching small non reproductive fish, cutting o the lifeline to the future. The right species is another important factor. To be able to see what species of fish enters your trawl and to be able to guide not wanted fish out will save the environment. To be able to make an early decision of what school to catch will save the environment, as the vessel will not travel more than strictly needed. All this is possible by using technology made by SIMRAD, and we will not stop here. Our goal is to always improve, in performance as well as with groundbreaking technology. 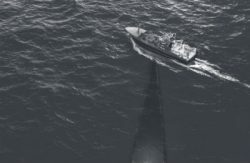 Since SIMRAD introduced the sonar technology to the commercial fishery in Norway in the 1950s, the products have always evolved around sound in water. Through a close connection with the scientific community, important developments such as instruments for quantification of biomass, fish size estimation and tools for species identi cation has been commercialized and introduced to scientists worldwide. We believe that a sustainable fishery is dependent on accurate tools to quantify and understand the marine ecosystem, and the SIMRAD products have always been in the forefront on providing for this. Sustainability in this context also involves the environment, and all SIMRAD products are designed to facilitate efficient surveys. Scientific Multibeam Systems are used to increase sampling volume with less ship time needed to achieve the survey goal. 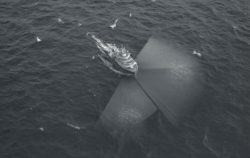 Trawl monitoring systems are used to monitor trawl behavior, as we believe optimal trawl performance also leads to reduced fuel consumption, less impact on the fauna and the right species and the right amount in the catch. Following the current mantra in management and research communities, SIMRAD now offers products for ecosystem monitoring, ranging from small plankton to large mammals. As the focus shifts from single fish stock management towards looking at the whole food web, SIMRAD shall continue to develop new and re ne existing tools for mapping the marine ecosystem. In SIMRAD omnidirectional sonars up to 480 elements are used to create multiple beams, covering 360° horizontally and 180° vertically. All elements are designed and produced in-house, thus the production of a single transducer will take several days. A good transducer makes a good echo sounder. SIMRAD produces a variety of transducers with ceramic or composite materials and center frequencies spanning from 12 kHz to 333 kHz. Most of these transducers can be operated in a split beam configuration with multiple receiving channels. 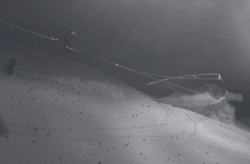 Wireless trawl sensors communicate acoustically between sensors and to the vessel. The ITI System can position each sensor in Lat/Long using Split Beam technology. 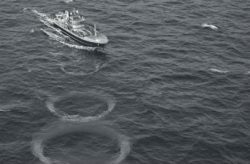 While 3rd wire systems use a communication cable from the vessel to the trawl. They all show real time information from the net regarding fish entry and trawl behaviour. Calibrated split-beam echo sounders operating at multiple frequencies are an essential research tool for any quantitative survey. The introduction of EK80 series by SIMRAD takes research to the next level with underwater scientific systems, which can operate as narrowband (CW) or wideband and be adapted to match any situation and environment. A scientific multibeam transducer consists of 800 individual elements that create configurations of multiple beams based on the user requirements. Combined elements are used to form beams in the shape of a FAN or MATRIX, allowing for real time 3D and 4D information to be collected.